Scott Gomez won the Stanley Cup with the New Jersey Devils in 2003, after defeating the Ducks in Game 7. Scott Gomez still finds it difficult to walk into the Pepsi Center in Denver. 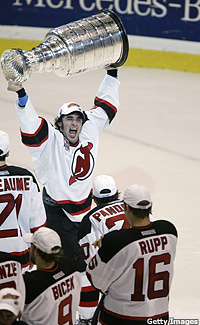 It was there seven years ago that the New Jersey Devils came within three goals of repeating as Stanley Cup champions. The Devils, who held a three-games-to-two lead in the series with Game 6 – and the Stanley Cup – in their own building, didn’t win again that season. Any party they had planned was cancelled after a 3-1 loss in Game 7. The flight home was silent. The hangover crept into the following season, which Gomez said basically was a wash. This June will mark the 10-year anniversary of the Detroit Red Wings winning their second straight Stanley Cup championship. During the ensuing decade, the Los Angeles Lakers, New York Yankees, Denver Broncos and New England Patriots repeated as champions in their respective sports. Detroit remains the last NHL team to do so. The Devils came close in 2001, the closest of any team since those Red Wings, but like many former Cup winners, their reign at the top of the hockey world came crashing down in defeat. That’s exactly what the Anaheim Ducks now are hoping to avoid. The Ducks know how special it is. They did it last season by blowing through Minnesota, Vancouver, Detroit and Ottawa in a combined 21 games. No series went the full seven games. No series truly was ever in doubt. No team could match the Ducks’ toughness. The tools are there for Anaheim to make another championship run. Seventeen regulars from last year’s playoff team remain on the roster. Anaheim also has added veterans Mathieu Schneider, Todd Bertuzzi and Doug Weight. Not one NHL fan should be shocked if coach Randy Carlyle’s crew is the last team standing again. Than again, if they are, recent history suggests it’ll be quite miraculous. “Maybe miracle is a bit strong, because I think they have a legit shot at it, but the reason it is so difficult is everyone is gunning for you,” said former Devils defenseman Ken Daneyko, a member of all three of New Jersey’s Cup-winning teams. “It’s so hard to come back when everybody is gunning for you. They use you as a measuring stick. Prior to the 1998 Red Wings, the NHL had a strong history of teams repeating as Cup champs. Five teams won it at least three years in a row. Montreal won five straight from 1956-60 and another four in a row from 1976-79. Then the Islanders went on their run of four in a row from 1980-83. However, in the past 17 years, the League has expanded from 21 to 30 teams, which obviously has decreased the odds of repeating. However, as former Islanders great Denis Potvin said, technology and free agency are the true culprits. “I would think it’s harder because of the changeover in players,” Potvin said. “We just celebrated 16 players that won four Cups in a row (on Long Island) and went to the Final a fifth year. That is a big difference. Potvin said video work undoubtedly played a factor in the Ducks needing only five games to dispatch Ottawa last season in the Final. Without the latest technological advances, Potvin doesn’t believe Anaheim would have exploited a perceived weakness in Senators goalie Ray Emery. Through video analysis the Ducks were able to exploit a weakness of Ottawa goalie Ray Emery, enabling them to quickly dispatch the Senators in five games. Detroit’s Ken Holland, the last general manager to win back-to-back Cups, said a team needs luck on its side to win the first Cup, but to do it the next year, too? Double down, shut your eyes, and pray your card comes up. “When we won the Cup in 1997, part of the reason is we lost one man-game to injury,” Holland said. “In 1998, in the third round, when we played Dallas they didn’t have Joe Nieuwendyk. In the second round, when we played St. Louis, I think in Game 2 they carried Al MacInnis off the ice on a stretcher. In the first round, when we played Phoenix, by Game 4 Nikolai Khabibulin, their No. 1 goalie, was hurt. Some fans – even some players – may think it’s OK if their team doesn’t repeat. Winning the Stanley Cup, after all, is one of the greatest achievements in all of sports. Shouldn’t one be enough, at least for right now? Right now, it is still the Ducks’ Cup, and it’s been a whirlwind ever since they rolled the trophy onto the Honda Center ice that magical June night. For that to happen again, the Ducks have to wipe that memorable moment out of their minds and start breaking down how they got there in the first place. They’re starting from scratch again. Everyone is.